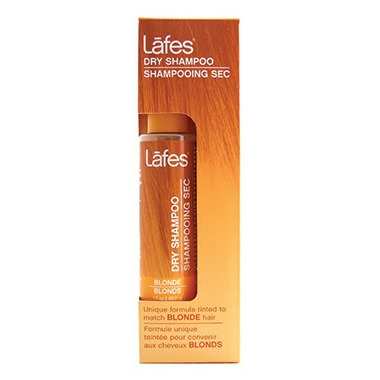 Lafes Dry Shampoo cleans and volumizes your hair while extending time between washings. It's great for at home, camping or on the go! This Dry Shampoo is made with argan oil, and Non GMO cornstarch. Plus it's gluten free and safe for color treated hair. All natural product. Ingredients: Zea Mays (Corn) Starch (Non GMO), Kaolin, Manihot Esculenta Starch (Tapioca), Sodium Bicarbonate, Silica, Equisetum Arvense (Horsetail) Extract, Citrus Limon (Lemon) Peel Oil, Argania Spinosa (Argan) Kernal Oil, Tocopheryl Acetate (Vitamin E), May contain Iron Oxides, Mica, Titanium Dioxide. Use to love it when it had a smell of lemon. Works well but the new bottle I bought smells like patchouli, which I don't like. This product has changed my life! I used to wash and style my blonde hair everyday, now can go 2-3 days without, even with moderate exercise. Saves me so much time. I completely agree with all of Melissa and Torontoniann's comments. Need to be careful of orange on the scalp, but it wipes away easily with a towel. Well worth the price given how long it lasts. I bought an extra, one for home and one for the gym. It's a bit pricey, but there's nothing else like it. I use this to hide my dark roots in between salon visits - use a stiff medium-sized makup brush to 'paint' over the roots. It really works to blend in with blonde hair. Be careful not to get too much on your scalp line, as it can turn a little orange-y. I just noticed that NO ONE has reviewed this product yet - so I just have to quickly tell everyone that this is by far the best natural dry-shampoo option out there for blonde hair. The applicator makes it super convenient and the bottle will last for 6 months, even with daily usage. I have extremely fine hair that gets greasy on my roots and dry on the ends, and you really cannot beat this product. Save your lungs and the planet! Don't buy an toxic aerosol dry shampoo - buy this.